Looking like a clutch of gigantic Faberge eggs perched on top of a wildly colorful gingerbread castle, the domes of St. Basil’s Cathedral are among Moscow’s most famous landmarks. This nearly-psychedelic riot of shapes and colors is more than 450 years old — but it’s even brighter today than it was back in 1560, when it was completed at the direction of the legendary Ivan the Terrible. St. Basil’s Cathedral was built to celebrate the victory of Ivan the Terrible over the Mongols in 1522. The building itself was all white, intended to match the white stone exterior of the nearby Kremlin. 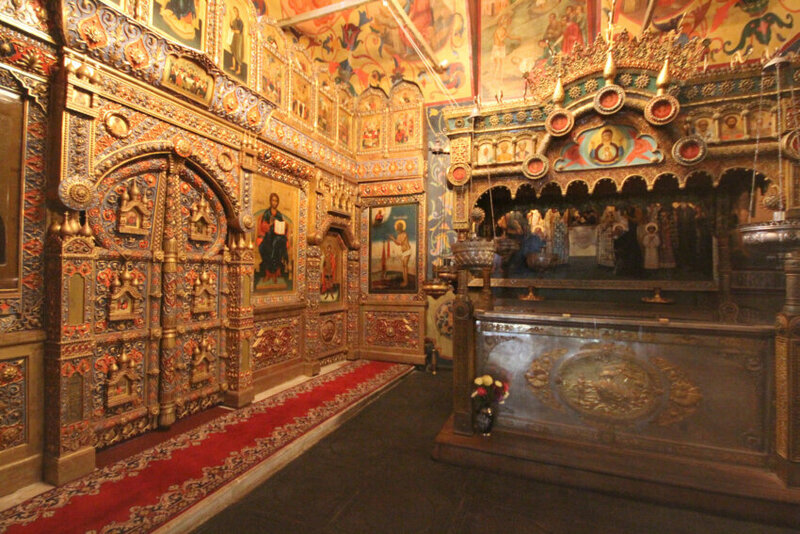 Its onion-shaped domes were made of tin and covered with a light gold leaf coating. Since then the Cathedral has gotten several facelifts. 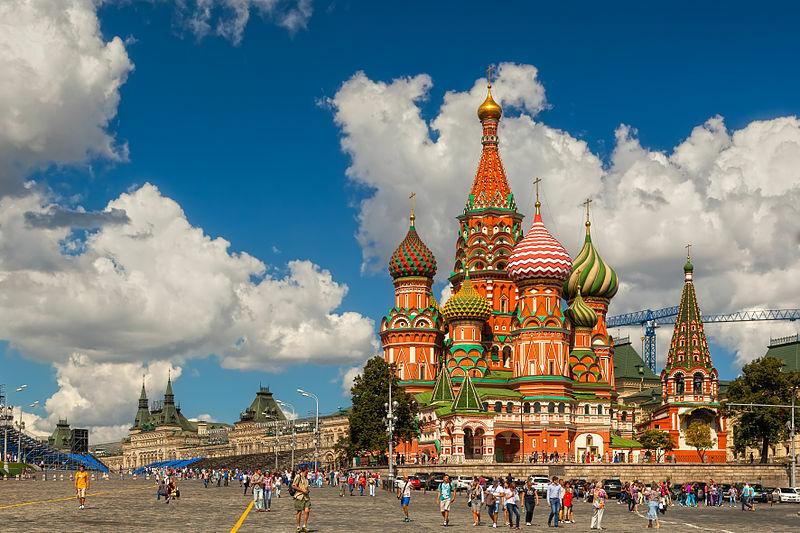 St. Basil’s was first remodeled in the 17th century, when the bell tower was added and the domes’ gilded covering was replaced with colorful decorations. A second makeover took place in 1860, when the entire structure was painted with the complex designs that visitors see today. 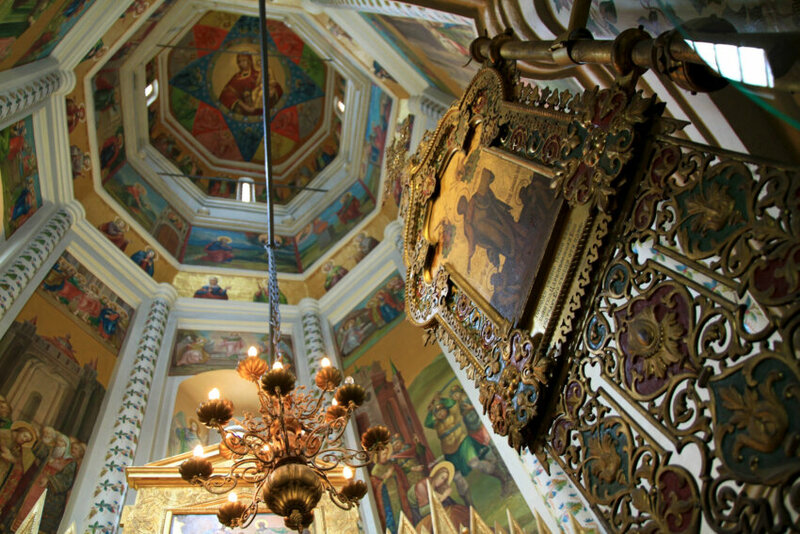 The official name of this Russian icon is The Cathedral of the Intercession of the Virgin by the Moat. But it’s been called St. Basil’s Cathedral ever since it was built, in honor of St. Basil the Blessed, whose body is enshrined in a splendid silver casket in his chapel beneath the cathedral floor. As you might guess, a 450-year old building has a lot of stories surrounding it — some true, some not. The most popular legend about St. Basil’s is that Ivan the Terrible had his architects blinded when the cathedral was finished, so they could never again create something so wonderful. This story is absolutely untrue. There are also stories about St. Basil’s Cathedral narrowly escaping destruction. 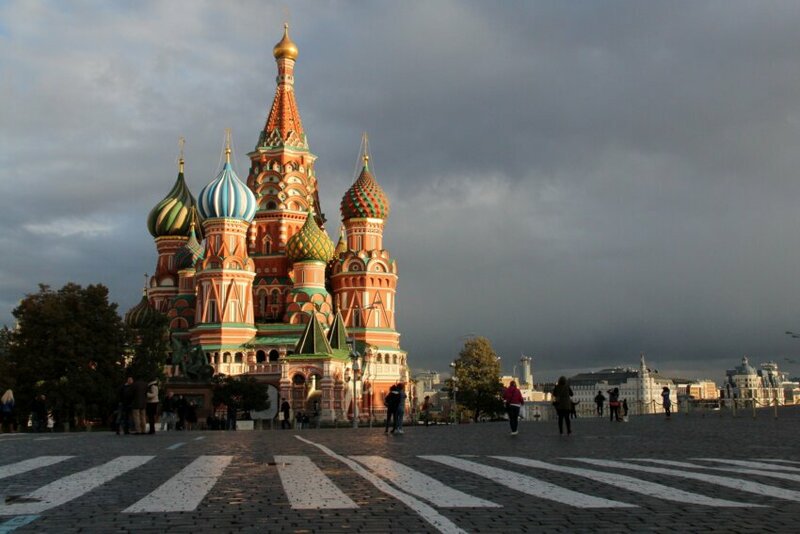 Legend has it that Napoleon attempted to burn St. Basil’s down, but it was miraculously saved when the fire was extinguished by a sudden rain storm. This one probably isn’t true, either — although Napoleon apparently did use the cathedral as a stable for his horses. However, it is true that Stalin planned to tear St. Basil’s down in order to make Red Square a bigger venue for political demonstrations. This time St. Basil’s was saved through the efforts of Russian architect and preservationist Pyotr Baranovsky, who refused to prepare the cathedral for demolition. He spent five years in prison as a result — but St. Basil’s endured. At first glance, St. Basil’s seems to be a chaotic structure — but it was definitely built with a symmetrical plan in mind. It’s the thought behind the plan that has puzzled students of architecture for centuries. Some experts will tell you that the configuration of a central church surrounded by eight chapels is a nod to the important medieval symbol, the eight-pointed star. Some insist that the structure was designed to honor the churches of Old Jerusalem. Others have a more interesting interpretation: that St. Basil’s eight domed chapels are a reminder of the eight assaults Ivan the Terrible’s armies made on the Mongol forces at Kazan. Whichever interpretation you like best, St. Basil’s Cathedral is clearly a wild mashup of Eastern and Western architectural styles — although once again, there’s a lot of disagreement as to exactly what those styles are. Some experts have called St. Basil’s the culmination of the old Russian traditional wooden church. Others see in its unique construction echoes of the Italian Renaissance, or of similar design trends in Renaissance Germany. 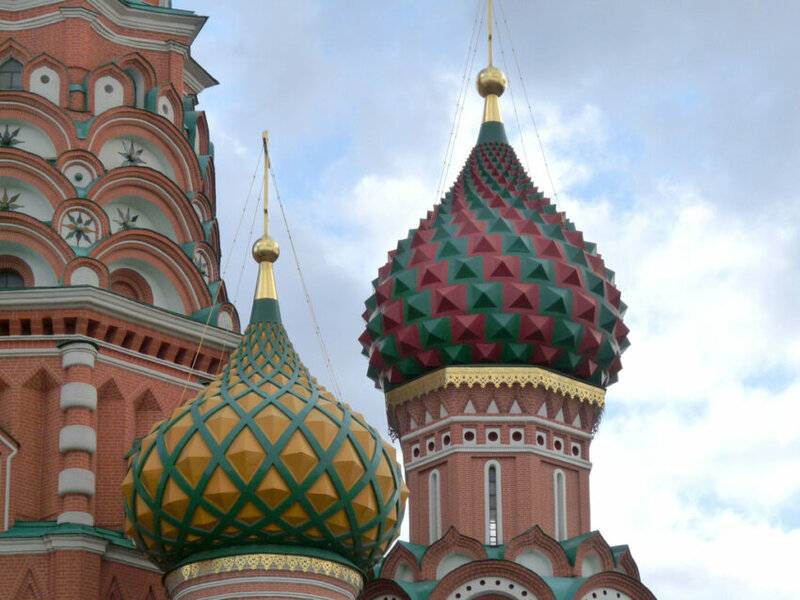 The only point everyone agrees on is that St. Basil’s incorporates a lot of the shape and style of an Islamic mosque. The controversies surrounding St. Basil’s even extend to the millions of tourists who photograph it every year. Whether they think St. Basil’s Cathedral is a sacred icon of Russia’s religious past or they think it looks like it belongs inside a snow globe, everybody’s got to agree on one thing: it’s without a doubt the coolest, kookiest landmark in Russia.